There is one central engine, located just ahead of the mast. It had a major overhaul in 2018. It runs through a prop shaft that raises out of the water when not in use. There is a 2016 30HP Mercury 4 stroke overboard motor that also raises and lowers, has electric start and controls at the helm station, that has 2 functions, firstly for maneuvering in tight spaces and secondly as a back up for the main engine. The boat steering is via a vertical quadrant system, beautifully made in wood that gives very easy, responsive helming, allowing a steering position over approximately a 10' range. The engine also heats the 80L hot water tank or it can electrically heated. The mast, standing rigging and sails were revised in 2017. The sail wardrobe has main, jib, genoa and roller furling genniker all from 2017. Boom is original custom carbon that does away with need for stack pack. The boat is built out of 3cm foam and epoxy, vacuum bagged with carbon and kevlar reinforcement at critical points. This was then finished with 2 pack paint, a lighter, more hard wearing finish than gelcoat with better bonding. Weight has been saved with this methodology but safety and strength not compromised. The design has a traditional feel with a clinker look which disguises the technology utilized. It has been set up to be a a very fast, strong and safe world traveler. 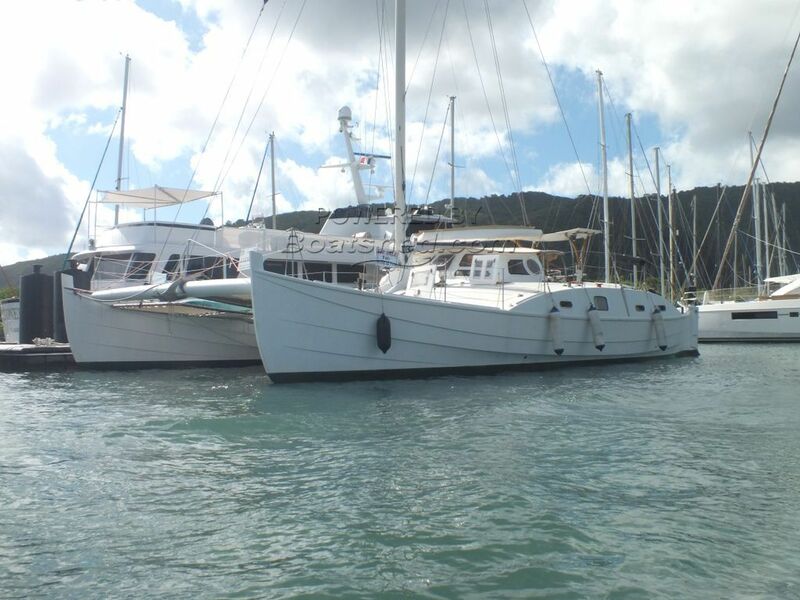 The layout of this boat is fairly open and allows the prospective owner many options. It was remodeled in 2011 professionally at the TOCATEC yard, a yard that builds minitransat and similar in high tech materials to move the galley from the port hull into the main salon, turning the old galley into a master suite with its own salon etc. In production terminology, an owners version. There are there 5 berths on this (port) side and 7 on starboard. The remodeling included building a room for watermaker, waterheater and other ancillaries. This boat is a highly unusual but desirable design one off, professionally designed and built in the Netherlands to an extremely high standard. The design specification was to build a light, fast, safe, world traveller in the latest materials but to incorporate a look that has influences from Scandinavia and Polynesia. Spacious and airy, she eats sea miles and because she is comparatively light, extremely economical under power. She will suit someone who seeks solid construction with performance and space over a production catamaran. This Alexander Verheus 50 has been personally photographed and viewed by Robin Hobson of Boatshed Martinique. Click here for contact details.